Kickboards can be useful when you are learning a new swimming stroke or want to improve your swimming technique. This article gives you a few ideas on how to use them and also outlines cases where alternative swimming aids are better. 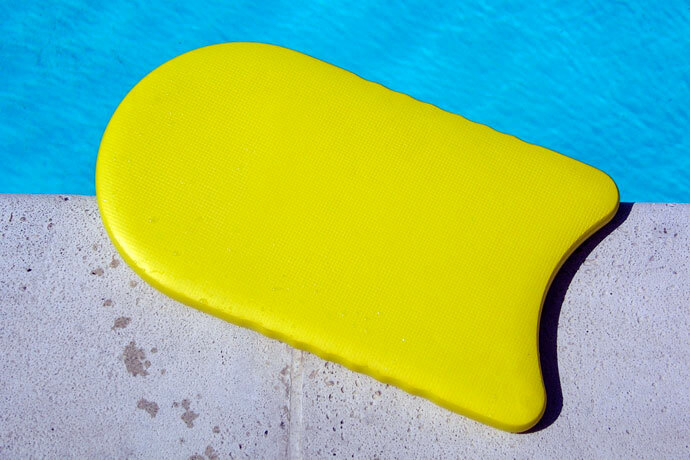 If you have ever been to a public swimming pool, you most likely know what kickboards are. If not, well they are those rectangular swimming aids made of EVA foam. The most common ones are about 1 by 1,5 foot large and 1 inch thick. They come in a variety of colors. Let’s now discuss their uses. In my opinion, the best use of a kickboard is to isolate the leg movements while you learn swimming breaststroke. To do so, grab one of the narrow ends with your hands, and hold the board so that the other narrow end points away from you. Then push off the pool ground, get into a horizontal position, and start to execute the leg movements of the breaststroke. Do this in short repeats so that you can catch your breath in between. The kickboard should provide enough buoyancy to your upper body so that you are free to concentrate on the breaststroke kick. Likewise, you can use kickboards to learn the flutter kick in the front crawl or the backstroke. To do so, again hold the kickboard in front of you so that the free narrow end is pointed away from you. Then get into a streamlined horizontal position and start to flutter kick. Again do short repeats. However, to learn an efficient flutter kick, I think short swimming fins are better. This is because they allow your hips to roll, they stretch your ankles, and the fins’ blades provide additional resistance so that your legs get a better workout. Another use of kickboards is to isolate the arm motions in front crawl and backstroke. To do so, just squeeze the board between your thighs so that your legs are supported. You are now free to concentrate on your arm motions while trying to swim. Using a kickboard to support the legs can be especially useful in the beginning if a pull buoy doesn’t provide enough buoyancy. Kickboards can also get you started learning the body undulation used in the butterfly stroke. To do so, put on swim fins, grab a kickboard, hold it by one of the narrow edges in front of you and get into a prone position in the water. Then try to push your hips down, then release them. As you release your hips, push your feet down. Then as your hips go down again, your feet move up. Repeat. This body undulation is one of the basics of the butterfly stroke. Kicking sets are another frequent use of kickboards. In fact, you use them exactly as described above in “Learning the flutter kick” section. But in this case, the focus is no more on learning the flutter kick but on building your legs’ endurance. This means that you flutter kick for several lengths using a kickboard. This is very exhausting, and most swimmers have a love/hate relationship with kicking sets. But don’t overdo these because holding a kickboard overhead in a prone position can strain the shoulders and contribute to swimmer’s shoulder. Also, as explained above, swim fins are better suited to build your legs. You also need to take into account that your legs only provide about 10% of propulsion in front crawl or backstroke. So it is important to work on more fundamental aspects of swimming technique first (namely balance, relaxation, arm anchoring in the water, etc.) before tackling that last 10% of propulsion with the legs. Kickboards are nice to have in your toolbox, especially while learning a new stroke. However, afterward, don’t forget to have a look at other options to improve your swimming technique. What kick board is better… One with 2 hole to grip the board and be able to hold on better or a kick board without the small rectangular holes? And is a back float or whatever it’s called recommended? And what kind of swim gloves/paddles do you recommend? Also, should I get a triangular shaper board too? I’m desperate for your suggestions and favorite brands that I can buy for my 2 son’s who can’t swim without life jacket, as of yet.